Steven (Chicagoland, United States) on 31 January 2013 in Cityscape & Urban and Portfolio. 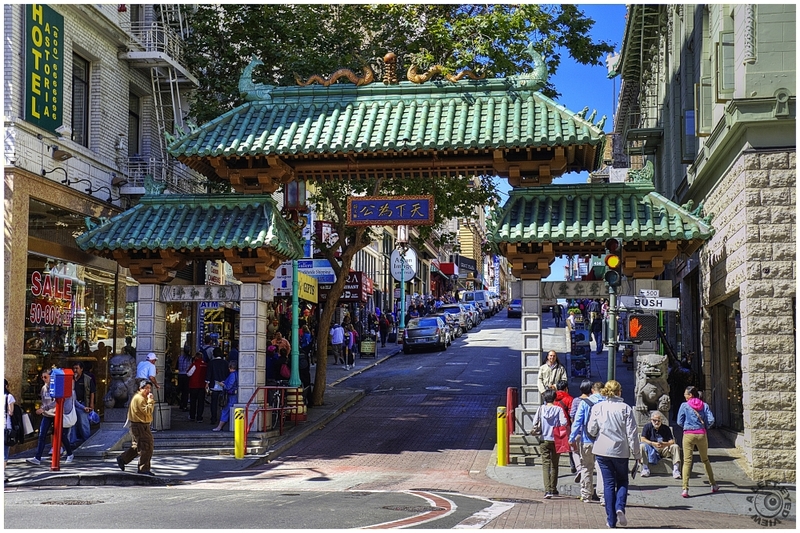 The Gateway Arch (Dragon Gate) on Grant Avenue at Bush Street in Chinatown, San Francisco, California, is the only authentic Chinatown Gate in North America. Unlike similar structures which usually stand on wooden pillars, this iconic symbol conforms to Chinese gateway standards using stone from base to top and green-tiled roofs in addition to wood as basic building materials. The Gateway was designed by Clayton Lee, Melvin H. Lee and Joe Yee in 1970. Photo captured August 20, 2012. That is, indeed, a very fine gateway . . these districts, wherever they are, are always worth a camera visit for the sheer sense of Life ! A beautiful shot of this lovely gateway. Wonderful vista into Chinatown. Interesting information as well about standards for these gates. I like it, not as garish and "in your face" as some of the gates in other cities, much more homely and authentic. Ah, really cool - I never would've thought these gates had to conform to a certain building code to be authentic. Nice shot, Steven! Much less garish than the elaborate one in Victoria B.C., I can tell you, and an excellent view through it into the hustle and bustle. Nice shot of this bright and busy place. Spent a month in China a few years ago, and saw many, many gates much like this one. It is like a wonderful explosion of color and textures. Magnificent image, Steven. What a beautiful street scene. The light and colors are lovely too. Oh ! Je suis très heureuse de voir cette vue bien nette. J'ai la même prise par mon mari en 1990, une photo argentique. Les magasins ont changé et il n'y avait pas les bornes jaunes. Merci Steven ! Beautiful! You are making me want to go back to San Francisco! Wonderful cultural gate inviting people into Chinatown; there is a similar arch like this in Philly's Chinatown - but not as authentic. Great street capture! San Francisco, so beautiful as in this photo which takes me to the time I spent 2 months there. Ahh, the sights and smells are so inviting ... thanks for sharing the gate info.